Boolean public property animation.shift defines whether shift animation will be turned off or on. Default is off and table content will be shifted instantly. If animation is turned on, then dragging will not be possible while animation lasts. This was needed to prevent possible collisions between animation and dragging. // set mode option to "shift"
Label of cloned elements is increased on every element cloning. Please see how event.clonedDropped event handler was used. REDIPS.drag has many event handlers hooked in different stages to simplify needed customization. Thank you, Thank you, Thank you, Thank you!!! I really hope you don’t hate me for this. :) Just an additional suggestion to help make this even better. It would seem more intuitive that once a drag & drop to the trash object has been completed, that all remaining cells be shifted back one to occupy the most recently deleted cell. Perhaps this could be a Boolean property? Presently, it leaves the end-user guessing about that “empty box” mid-stream with all the other cells. I find end-users wanting to manually shift cells to back-fill the deleted one. @Chris – First I’m glad you like how shift works. It’s very useful option and new feature moved REDIPS.drag library to the new level. On my first guess, filling the gap after element is deleted should not be a problem to add. In next several days I will prepare new version with a boolean property as you suggest. @Chris – REDIPS.drag is upgraded with new feature (ver. 4.5.4). If public property shift_after is set to true, then table content will be shifted after DIV element is moved to the trash cell. Hope this will be fine, cheers! Hello Darko! Congrats for your great work. I’m trying out with your example 9, and I wonder if there’s a function that could make a dragged object return to its first position. 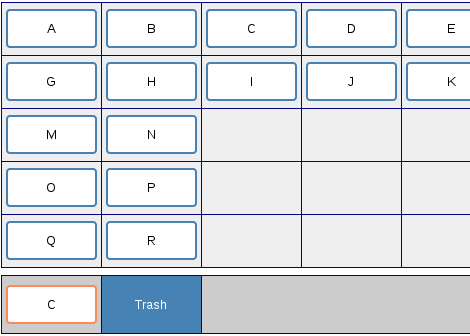 I want to drag an object to a table cell, and then, make that object return (or appear) in its first position with a click. Is it possible? Thanks in advance! @dbunic – Thanks for your reply! The code works, but I want the dragged object to return to the same specific position. Take your example 9. There are four draggable objects and four dropzones. If you add the function undo on clicking a draggable, it returns to the last position, so that means that if you have dragged it from another dropzone (and not the initial position or mark cell) it returns to that dropzone. And what I want is that the dragged object returns always to its original mark cell. @dbunic – I’ve been trying out hard, but I can’t reuse that for example 9… When I click a dragged object, all the dragged objects return to their initial positions. But I only want the dragged object that I click to return. Is it possible? @David – Example09 is modified and dblclick on element will return DIV element to initial position. Please click on preview link below post title and try example09. Hope this improvement will be helpful. That’s exactly what I wanted! You’re great. Wonderful stuff and you have done a great job here! I have a question, I’m using the shift content feature to arrange the sequence of photos in a photo album. It works great. Only that I’m not able to save the new photo arrangement to the server. In each cell, I have photo ID and photo order. At each drop, I handle rd.myhandler_dropped event such that I loop through the cells in the table and update the photo order in each cell with a new order number. However when I click on ‘Save Photo Order’ button and postback, at the server side I’m still getting the old photo ID and photo order values (as per before arranging the photos). I can’t seem to capture the new values for the photo orders. Do you have any suggestions for my problem? Or is there a better way of achieving the objective here? I’m using ASP .Net + VB. @Yenyen – REDIPS.drag contains a primitive save_content() function which scans table(s) and prepares a query string for submitting to the server. It’s only important to set ID for each DIV element. Please take a look to Example01 – Three tables to see how content of first table is sent to the server (save button is placed below tables). Better solution is to use JSON and I hope in next period save_content() will speak JSON. I have set the photo ID to the ID attribute of each DIV, parse the content that is sent via save_content() and save the photo order at the server side. It is working now, thank you so much! @Yenyen – I’m glad your problem is solved and saving pictures is working. Instead of initialization in body onload, you can write JS code in separate script.js file (like I did in all examples inside redips2.tar.gz package – except example0). Great library you have here, and thanks for making it available to us. What I can’t figure out is why I can’t successfully attach a jQuery “delegate” click event handler to “a.section_del_btn”. It seems as if the Redips drag-n-drop code prevents the “delegate” function on the “a” tag/element from working. What a click on the anchor link (image) will do is to toggle the image “src” between “check.png” and “uncheck.png”. Would you by any chance have any suggestion on how to go about it? Would appreciate any suggestions you may have on this. I’m unable to include the sample code/ structure here for you to see. I’m sorry. You can email me JS code to attach it to your comment. Anyway, onclick event of DIV element is reserved for dragging and there can’t be another listener for that event. event handlers to be executed on DIV element click (or on double click). I have two checkbox in my form page, I have to give value like R & W , I want store one value, pls help me.